Fili is the nickname of the Children’s Philharmonic Orchestra from Szentegyháza (Transylvania, Romania). The orchestra and choir recently toured Canada to honor the country’s 150th anniversary visiting seven cities and giving 11 concerts. The musical group was founded 35 years ago in the ethnic Hungarian-speaking community and gained fame under the direction of Sándor Haáz. In the last decades the children’s ensemble has grown to 140 members; this was their first overseas tour. Canadian-Hungarian organizations and the Government of Hungary generously sponsored their trip. 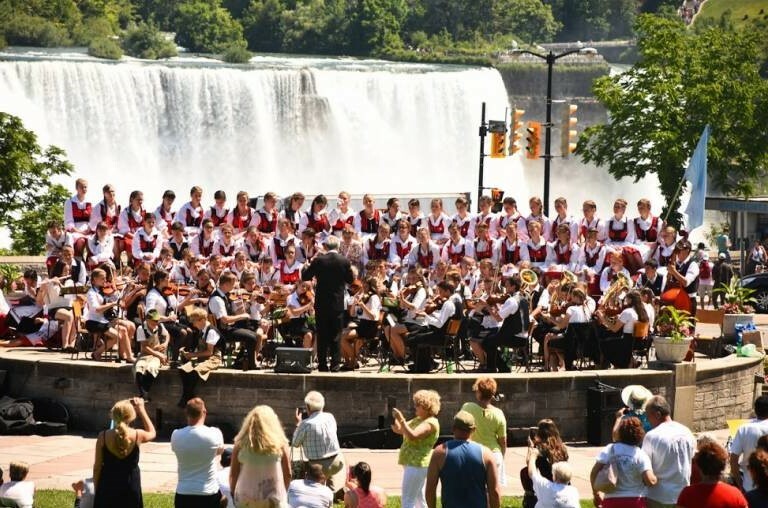 The Children’s Philharmonic Orchestra of Szentegyháza at Niagara Falls. While Hungarian government politicians in Budapest are attacking Romanian politicians and accusing them of “anti-Hungarian” sentiments, and while on the other side of the border, Romanian right-wingers are fanning the nationalist fire, it was good to see these ethnic-Hungarian children presenting a piece of Romanian culture. Andrian Ligor, Romania’s Ambassador to Canada, also attended one of their concerts and spoke highly of the ensemble. These children do not look at Romanians as enemies, they seem to appreciate and respect Romania’s folk culture and are eager to build a friendship between the Romanian and Hungarian peoples. It is heartwarming that these children know more about respecting other peoples and cultures than the politicians in Budapest and Bucharest, who are always ready for mudslinging. Their Canadian tour proved that multiculturalism is just fine, and politicians in Hungary and Romania have a lot to learn from Fili, the Children’s Philharmonic Orchestra of Szentegyháza. It’s rather multi-nationalism. Children of two neighboring nations, where so many of the members originate from across the common border, is really not the mush of “multi-culturalism”. Did they sing Swahili ? I did not think so. Oh, in English, but that is the common language of the host-nation, as well of the world today. Very cool and uplifting, thanks for the article and video! Would like to hear more of the positive work and relations between national cultural groups in Romania (where I believe a German-Transylvanian is now the president). Actually, the Hungarian-Canadian community was going to sponsor them to come on tour here, but the Hungarian Gov took it out of our hands and financed the whole thing. It cost 47 million forints and the concerts were free for the Canadian audiences. This is not the first time the Hungarian gov overrides and takes over cultural events that the local Hungarian-Canadian communities initiate. I personally am disgusted by the sheer amount of spending that is going on in this area. Think about it: a chorus from another country (forget for a moment that they are ethnic Hungarians) is financed by the Hungarian gov to go to a third, richer country and offers the concerts for free to the “rich” citizens. Something is really wrong here. I am all for supporting the Hungarian minorities in the neighbouring countries, sure, the Hu gov can pay for the chorus to tour Hungary, and maybe a Hu chorus can tour Transylvania and other HU ethnic communities in neighbouring countries, send some KCSP “community organizers” to the Csangos, for example, but I disapprove of all these guests being brought to Canada for free (for us). Don’t bother with triffles like 47 millions. The Orbán mafia has embezzled/stolen at least 1400 BILLION ft since 2014. Dear Canadian: It is not clear to me why are you disgusted. The money was spent by the Government of Hungary, giving us the pleasure of enjoying the visiting children, and giving 150 children the opportunity to travel and see Canada. If you live in Canada, you got a present from Mr. Orban. If you live in Hungary, well, you should be proud of your Government spending money like this rather than spending it on weapons. 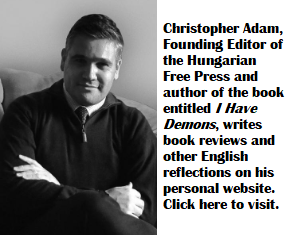 I am pleased seeing and hearing them and I even more admire the Hungarian Government. can recover with good leadership, hard work and talent. Its true, but it’s not recovering, but sinking, and its not a good leatherdhip, but mafia state, and not hard work and talent, but robbery and counter selection. Witness the downward trends, and some appalling figures, in almost every indicator: investment, business environment, productivity, growth, innovation, education, health, healthcare. Not to mention the institutionalized corruption and gross incompetence. You are definitely an ill person, blind in hatred. If this was not the most monotone, lifeless, joyless u tube one ever heard and saw? Ted: nothing is for free when it comes from Orban. There is always a moral price to pay. Am I right in assuming you live in Canada and will be casting your vote in the next Hungarian elections? A thank you for Orban for paying attention to us Hungarian-Canadians?